The next best thing to flying to the International SpaceStation is NASA?s virtual ringside seat. 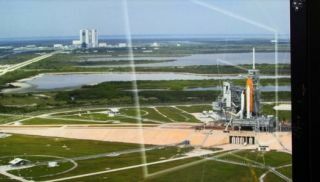 NASA teamed up once again with Microsoft to offer onlineusers two new three-dimensional, interactive tours ? one of the orbitingoutpost and another of the next Mars rover. Space enthusiasts can see andinteract with photos of the station and therover and navigate around them in three virtual dimensions with the clickof a mouse. The magic is made with hundreds of digital photographs thatastronauts snapped, all stitched together using Microsoft?s Photosynthtechnology. ?Although you're not flying 220 miles above the Earth at17,500 miles an hour, it allows you to navigate and view amazing details of thereal station as though you were there," Bill Gerstenmaier said in astatement. Gerstenmaier is an associate administrator for Space Operations atNASA Headquarters in Washington. Viewers can click and drag their way around NASA?s hardwareand zoom in to see the details like the space station's modules and solar arraysor zoom out for a big-picture view of the complex. NASA astronaut SandraMagnus took the internal images of the space station during the 129 daysshe lived onboard. She photographed the station?s exterior while aboard thespace shuttle Discovery, which flew her back to Earth in March. The roverimages were taken of a full-scale model in a Mars-simulation testing area atthe Jet Propulsion Laboratory in Pasadena, California. Photosynth has multiple potential benefits for NASA.Engineers can use it to examine hardware, and astronauts can use it for spacestation familiarization training, NASA said in a statement. NASA's Photosynth collection can be viewed at http://www.nasa.gov/photosynth.The NASA images also can be viewed on Microsoft?s Virtual Earth Web site at http://www.microsoft.com/virtualearth.